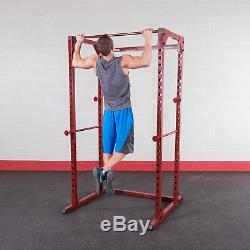 Body Solid Heavy-Duty Home Gym Workout Station Weight Lifting Fitness Power Rack. 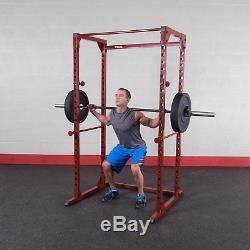 Get busy getting stronger with this power lifting rack for strength training. 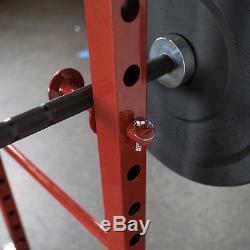 A high-strength 14-gauge, 2 x 2-inch steel mainframe. 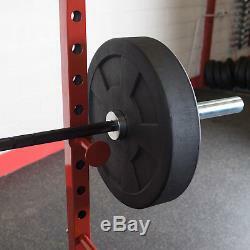 23 weight rack positions spread 3 inches apart. Comes with 2 adjustable lift offs and full length safety bars. 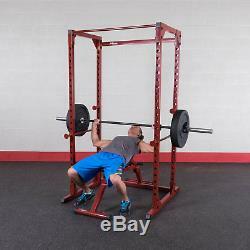 Use for bench press, incline press, decline press, shoulder press, squats, bicep curls, dead lifts, chin-ups and more. If working out is your favorite time of the day, spend your time bonding with the Body Solid Home Gym Workout Weight Lifting Power Rack. 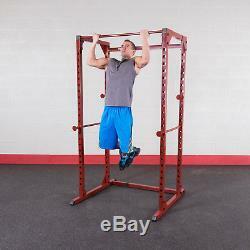 This ultimate power rack is heavy-duty and has a generous area for getting your workout on. This weightlifting power rack has the room to fit a weight bench, olympic barbell, and weights so you can do everything from squats, to pull ups, to bench press, and more. Resistance bands can also be attached for even more exercise options. 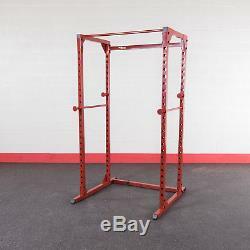 Built for the serious home strength trainer who wants a durable customization cage of a pro weight room. 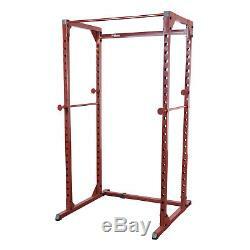 This home gym also features 23 weight rack positions, a 14-gauge steel mainframe, and powder coat paint for durability. 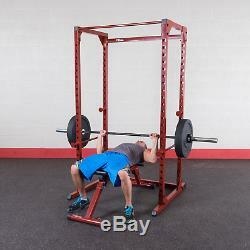 Bring the muscle-shredding potential of the gym to your own home and start getting stronger every day with the Body Solid Home Gym Workout Weight Lifting Power Rack. Powder coat paint finish for durability against wear and tear. Dimensions: 45.5 x 46.5 x 82 inches. With over 20 years of experience, Body-Solid offers one of the widest arrays of products in the industry including multi-station gyms, free weight machines, a complete line of cardiovascular products, weight plates, kettle bells, dumb bells and fitness accessories. Originally founded in 1989, Body-Solid has grown from its original 10,000 square foot warehouse to an over 200,000 square foot distribution facility and world wide head quarters, based just outside Chicago in Forest Park, Illinois. The Company sells its products in the United States, Canada, and over 100 other countries worldwide. S dedication to quality craftsmanship, customer service and value has enabled it to develop a premier reputation within the fitness equipment industry. Body-Solid Commercial Products are recognized to be the toughest and most reliable products in the commercial fitness marketplace. Our equipment is built to withstand the demands and abuses of multi-user environments. We offer the widest selection of commercial rated products in the industry. Re looking at creating a brand new facility, or adding on to your current fitness room, Body-Solid has the right equipment for you. Our products cover a wide range of applications, from space conscious multi-station gym systems, to individual single and dual purpose selectorized stations for larger higher use facilities. We offer a full line of leverage free weight stations and competition benches as well as bars, plates, dumb bells, racks and accessories. Built for Life, Built for You. Cancelling Your Order: Your order is important to us and will be processed immediately. Select the reason for the return. This listing is currently undergoing maintenance, we apologise for any inconvenience caused. The item "Body Solid Heavy-Duty Home Gym Workout Station Weight Lifting Fitness Power Rack" is in sale since Friday, November 17, 2017. 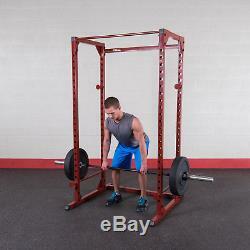 This item is in the category "Sporting Goods\Fitness, Running & Yoga\Strength Training\Power Racks & Smith Machines".